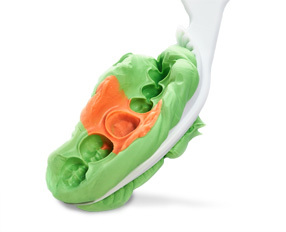 The Centrix NeedleTube delivery provides superior results compared to spiral paste fillers. 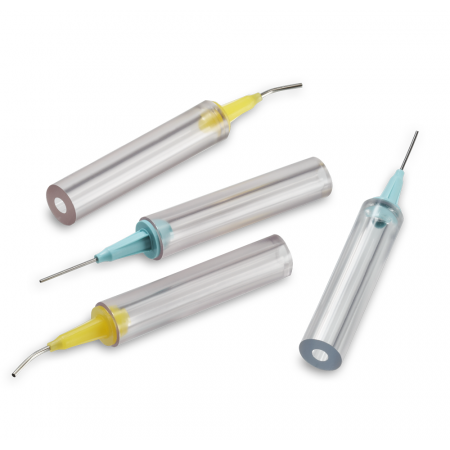 Calciject is a fine-grain, calcium hydroxide paste packaged in single-dose NeedleTube syringe tips. The high pH and bacteriostatic activity of pure calcium hydroxide paste is indicated for use in temporary and intermediate root canal therapy. Order contains 24 .2g prefilled tips. Can you use IRM with Calciject? No, the eugenol in IRM will eat away at the Calciject. When can Calciject be used? Remove Calciject cartridge from package. Pull off sheath cover and insert into Centrix C-R® syringe. Test first on pad. Squeeze with a slow, steady pressure. Bend needle, as needed, and inject into canal. After use, remove Calciject cartridge and dispose of properly.